If you own a 16GB iPhone, you are probably used to seeing the “Not Enough Storage” message when you try to download an app or take a photo. But what if there was a way to magically free up storage on your iPhone without deleting any photos or apps? As a Reddit user pointed out last month, there’s a way to “trick” your phone into freeing up storage space without deleting apps or photos. First, go to Settings > General > About and see how much storage you have available. For the example below to work, you need to have less than 8GB of available space on your iPhone. Next, head over to the iTunes store and search for War and Peace (1956) HD and find the “RENT” ($3.99) option. Why War and Peace? That’s where the trick comes in. If you were to rent this movie, it would take up 8.86GB on your iPhone. But you have less than 8GB free, right? Once you see this message, wait about 10 seconds before you tap Settings. Then navigate to General > About and you should see some additional storage space available on your iPhone. You can repeat this same process again and it might free up additional storage space. We repeated these steps five times and went from 450MB to 1.6GB of free space on a 16GB iPhone 6. One user in the Reddit thread said they went from 233MB to 4.9GB. As you can expect, results will vary. Important note: Once your phone has enough free space for the 8.86 GB rental, the movie will successfully download and you’re out $3.99. Be sure to keep checking your available space if you’re repeating the steps above. Once you get close to 8GB of storage space, you should stop. When you attempt to download a file that is too large, in the background your iPhone is clearing unnecessary data, cookies, history, and other app caches that are no longer needed in an effort to make room for the large file. 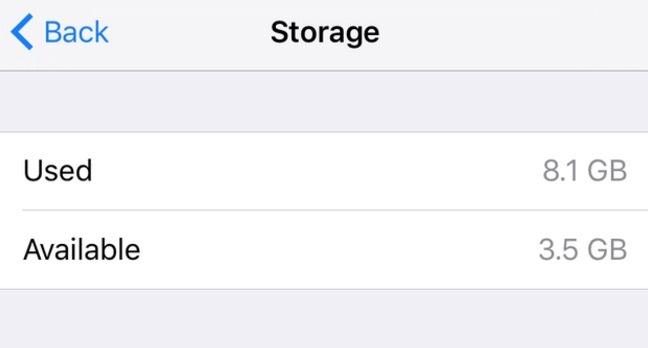 After going through the above steps, you can also go to Settings > General > Storage & iCloud Usage > Manage Storage and you will notice some apps are using less storage than before. CNET said this is most likely a storage issue (or a bug) that Apple should investigate.